Smart home tech and artificial intelligence headlined LG’s annual innovation event, InnoFest, this year. Held in South Korea’s wired-up capital, Seoul, LG showed off its vision for the home of the future through crafted living spaces at its LG Science Park flaunting the company’s latest AI powered home appliances and TVs. The theme was clear. LG wants to make your life simpler by making all the various devices in your home do most of the thinking for you. They achieve this by integrating ThinQ, LG’s deep learning platform, across their range of home appliances including refrigerators, washing machines, cooling solutions and even robot vacuums. What makes the ThinQ branded devices different is their ability to talk to one another and make proactive recommendations based on user data. The ThingQ AI-enabled appliances come with Google Assistant and Alexa support to allow voice control and aid communication with other devices. But LG’s deep learning platform takes things a step further by understanding user habits through usage patterns and make anticipatory suggestions such as smart recipe recommendations based on ingredients present in your fridge, preventative device care instructions or automatically turning on your air purifier on a dusty day. 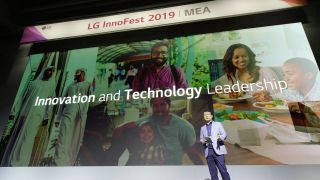 Jame Lee, LG’s President for the MEA region, is determined to reposition LG as a premium electronics brand in the region and reaffirm LG’s status as “technology trailblazers” by continuing to evolve their product lines and offer innovative solutions that make their customer’s lives simpler. Sure, LG’s vision for the modern connected smart home is bold, so is their effort to make AI accessible to a wider audience. These new devices tout sleeker designs and have new tricks up their sleeves but don’t expect them to come cheap. LG’s OLED TVs are a sight to behold and have deservingly picked up a number of accolades including our own Best in Class pick. This year’s lineup is looking equally impressive with updated chips and AI smarts to spruce things up. These TVs will also be the first in the region to have full support for Arabic language. Leading the lineup is LG’s flagship OLED TV series (W9, E9, C9, B9) powered by the latest Alpha 9 Gen 2 processor which delivers the same boost in performance and color accuracy as the Alpha 9 chip except this gen upgrade brings on board a more intelligent AI and deep learning algorithms to enhance picture and audio quality. There’s also support for Dolby Atmos and Dolby Vision to sweeten the deal. Aside from the high end OLED TVs, LG will also continue to offer their Super UHD TV series now rebranded as NanoCell TVs. They come in varying sizes from 49 to 77-inches and offer almost everything the OLED TVs do except for the OLED panel and sport the Alpha 7 Gen 2 processors.The top end of these TVs will offer Full Array Dimming Pro for uniform black levels and support for Dolby Vision and Dolby Atmos. All TVs boast AI Smarts that will allow you to not only control the TV but other connected home appliances by simply talking to your TV remote. The TV can also make smart suggestions based on your viewing habits. The pinnacle of the LG TVs shown at InnoFest was their futuristic LG Signature OLED TV R. An absurdly thin rollable display panel that unfurls from a streamlined box that’s also a sound bar. The panel itself is 65-inches in size and touts 4K ultra HD and HDR capabilities. Users can choose to roll out the entire display panel or have just the top peeking out of the attractive unit and use it as a dashboard to display and control a myriad of smart home devices. LG also flaunted their “evolved” ThinQ AI enabled home appliances, which are now even more smarter, convenient and energy efficient. Starting with the kitchen, consumers have LG’s streamlined and attractive series of refrigerators to look forward to that now come with InstaView - a mirrored panel that allows you to peek inside the front compartment with just a couple of knocks on the door which prevents unnecessary loss of cold air. With AI on board, the fridge can snap a picture of what’s inside and come up with a nifty list of recipes or remind you when you need to top up on a particular ingredient. If you have one of LG’s new ThinQ ovens (available in glass and convection configurations) your fridge can send the recipe to your oven and it will set up timers and cooking settings accordingly. LG is also gunning to make your laundry days less dreary and managing your wardrobe a little less tedious. With their new TWINWash series of washing machines you can do two loads of laundry concurrently in almost half the time. There’s also a plethora of new tech in these machines that use additional nozzles to create efficient jet streams all around the tub. They are able to get to the grittiest stains without affecting the integrity of fabrics. Also on display was LG’s smart steam closet unit also known as a styler. The basic idea is to hang your daily wear clothes inside this smart wardrobe and it uses steam and a vigorous back and forth motion to keep your clothes fresh and wrinkle-free. The cooling solutions on offer continued LG’s theme of simplification and convenience. The air conditioners come in as wall mounts on vertical stands and are overall better at conserving energy. You can also rely on them to purify air to a certain extent and also control them via the ThinQ platform. There were also mini portable air purifiers on display that are battery powered and will give you clean air on the move. Rounding things out was LG’s vacuum lineup which consisted of their cordless vacuums boasting 80 minute charge cycles thanks to double battery packs and a circular disc like robot vacuum with sophisticated sensors than can also be controlled through ThinQ. In theory the idea of LG ThinQ sounds appealing and even useful under certain circumstances but it requires a lot of things to go right for it to work seamlessly and it seems more wishful thinking than functional for now. Also on display at LG’s Science Park were the company’s premium LG Signature & LG Objet range of devices targeted towards what LG calls the “sensible rich”. These top of the range appliances tout minimalist aesthetics designed to blend in modern living spaces and are brimmed with tech. Take the LG Signature refrigerators for instance that sport a giant minimal bezel screen that allow you to peek inside with a couple of taps without having to open the compartment and losing precious cold air. It also opens the door automatically once it senses you’re near and comes with modular wine cellar and bottom-freezer configurations. There’s also a twin-wash washer and dryer as well as a sleek looking air purifier in LG Signature lineup that can detect and catch the tiniest specks of dust to ensure clean air circulation. But the main attraction of the LG Signature series is the rollable OLED TV R that unfurls from a box that also doubles as a sound bar (more details above). If you’re really looking for appliances with unique design that seamlessly blend with your furniture then LG’s Objet series might just be for you. This series of devices mask appliances in wood and metal and can look like any other piece of furniture in your living space. We saw a sleek looking sliding TV embedded in a slim entertainment center, an audio system and a fridge unit that can pass off as a nightstands or end tables.